For the negotiations leading to the 1979 Egypt–Israel Peace Treaty, see Camp David Accords. 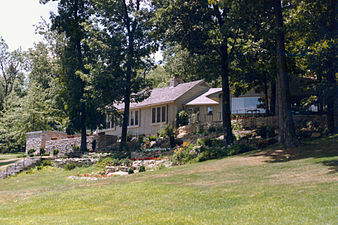 For the summit in 2000, see 2000 Camp David Summit. Originally known as Hi-Catoctin, Camp David was built as a camp for federal government agents and their families by the Works Progress Administration. Construction started in 1935 and was completed in 1938. In 1942, President Franklin D. Roosevelt converted it to a presidential retreat and renamed it "Shangri-La" (for the fictional Himalayan paradise in the 1933 novel Lost Horizon by British author James Hilton, which he had jokingly referenced as the source of the Doolittle Raid earlier that year). 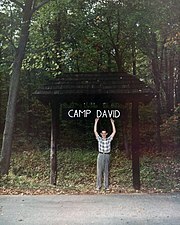 Camp David received its present name from Dwight D. Eisenhower, in honor of his father and grandson, both named David. The Catoctin Mountain Park does not indicate the location of Camp David on park maps due to privacy and security concerns, although it can be seen through the use of publicly accessible satellite images. Franklin D. Roosevelt hosted Sir Winston Churchill in May 1943. Dwight Eisenhower held his first cabinet meeting there on November 22, 1955 following hospitalization and convalescence he required after a heart attack suffered in Denver, Colorado on September 24. Eisenhower met there with Nikita Khrushchev for two days of discussions in September 1959. 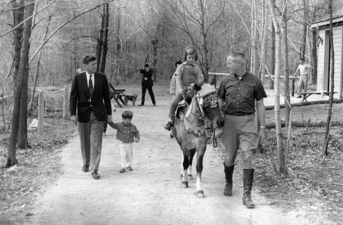 John F. Kennedy and his family often enjoyed riding and other recreational activities there, and Kennedy often allowed White House staff and Cabinet members to use the retreat when he or his family were not there. 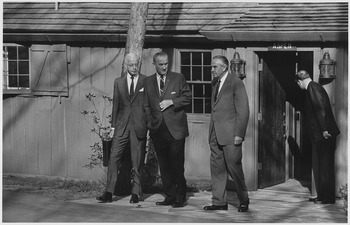 Lyndon B. Johnson met with advisors in this setting and hosted both Australian Prime Minister Harold Holt and Canadian Prime Minister Lester B. Pearson there. Richard Nixon was a frequent visitor. He personally directed the construction of a swimming pool and other improvements to Aspen Lodge. Gerald Ford often rode his snowmobile around Camp David and hosted Indonesian President Suharto there. Jimmy Carter initially favored closing Camp David in order to save money. Once Carter actually visited the place, he decided to keep it. 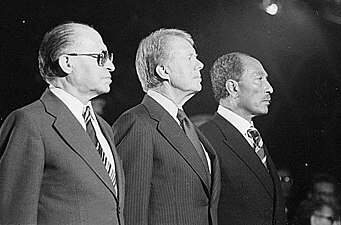 Carter brokered the Camp David Accords there in September 1978 between Egyptian President Anwar al-Sadat and Israeli Prime Minister Menachem Begin. Ronald Reagan visited the retreat more than any other president. In 1984, Reagan hosted British prime minister Margaret Thatcher. George H. W. Bush's daughter, Dorothy Bush Koch, was married there in 1992, in the first ever wedding held at Camp David. During Bill Clinton's time in office, British prime minister Tony Blair was among the many visitors that the President hosted at Camp David. George W. Bush hosted dignitaries, including President of Russia Vladimir Putin, there in 2003, and hosted British prime minister Gordon Brown, in 2007. George W. Bush also hosted Danish Prime Minister Anders Fogh Rasmussen in June 2006. Barack Obama chose Camp David to host the 38th G8 summit in 2012. President Obama also hosted Russian Prime Minister Dmitry Medvedev at Camp David, as well as the GCC Summit there in 2015. President Donald Trump hosted congressional leaders at Camp David as Republicans prepared to defend both houses of Congress in the 2018 midterm elections. The summit at the presidential mountain retreat in Maryland came weeks after the White House and the GOP-controlled Congress scored their first major legislative victory of the year with tax reform. On July 2, 2011, an F-15 intercepted a small two-seat passenger plane flying near Camp David, when President Obama was in the residence. The civilian aircraft, which was out of radio communication, was intercepted approximately 6 miles (10 km) from the presidential retreat. The F-15 escorted the aircraft out of the area, and it landed in nearby Hagerstown, Maryland, without incident. The civilian plane's occupants were flying between two Maryland towns and were released without charge. On July 10, 2011, an F-15 intercepted another small two-seat passenger plane flying near Camp David when Obama was again in the residence; a total of three planes were intercepted over that July 9 weekend. Menachem Begin at Camp David, 1978. 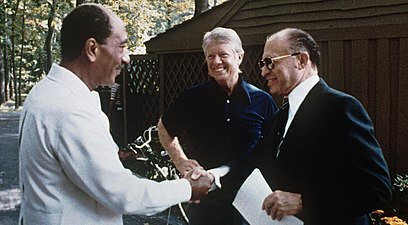 Anwar Sadat, Jimmy Carter, and Menachem Begin meet on the Aspen Lodge patio, September 6, 1978. Margaret Thatcher and Ronald Reagan in Aspen Lodge, 1984. Thatcher and Reagan walk at Camp David in 1986. 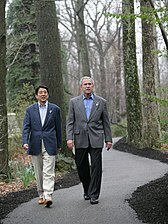 Shinzō Abe, Prime Minister of Japan, and George W. Bush at Camp David, April 2007. Barack Obama and Joe Biden at Camp David in 2010. World leaders at the 2012 G8 Summit. (Clockwise) Obama (standing), Cameron, Medvedev, Merkel, Van Rompuy, Barroso, Noda, Monti, Harper, and Hollande. ^ "Thurmont town, Maryland." United States Census Bureau. Retrieved on February 4, 2011. ^ Eisenhower, David; Julie Nixon Eisenhower (2010). Going Home to Glory: A Memoir of Life with Dwight David Eisenhower, 1961–1969. New York: Simon and Schuster. p. 31. ^ a b "Camp David". Whitehouse.gov. Archived from the original on June 30, 2009. Retrieved June 29, 2009. ^ "Dwight D. Eisenhower: Message Prepared for the Conference on Fitness of American Youth". ^ "Khrushchev and the Spirit of Camp David". aboutcampdavid.blogspot.no. December 28, 2012. ^ "272 - Address at the State Department's Foreign Policy Conference for Educators". The American Presidency Project. June 19, 1967. ^ W. Dale Nelson, The President is at Camp David (Syracuse University Press, 1995), pp. 69-94. ^ "Camp David: A History of the Presidential Retreat". Infoplease.com. July 18, 1942. Retrieved June 29, 2009. ^ "Trump makes first trip to Camp David as president". Retrieved April 22, 2018. ^ "Bush's Daughter Marries With 'a Minimum of Fuss'". The New York Times. June 28, 1992. ^ E., CAMPBELL, DOUGLAS (2016). CONTINUITY OF GOVERNMENT : how the u.s. government functions after all hell breaks loose. [S.l. ]: LULU COM. ISBN 9781365614422. OCLC 983641588. ^ Sanger, David (September 27, 2003). "With issues to resolve, Bush welcomes Putin to Camp David". The New York Times. Retrieved August 6, 2011. 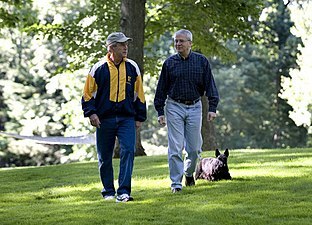 ^ "Brown to meet Bush at Camp David". BBC News Online. July 26, 2007. Retrieved August 6, 2011. ^ "Fogh på besøg hos Bush i Camp David" [Fogh visiting Bush at Camp David]. Politiken (in Danish). June 9, 2006. Retrieved January 2, 2014. 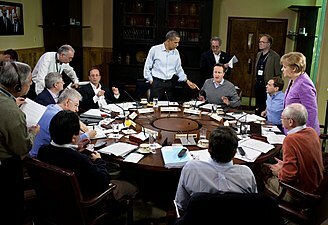 ^ "White House moves G8 summit from Chicago to Camp David". CBS Chicago. CBS Chicago. March 5, 2012. Retrieved May 18, 2012. ^ "US hopes Assad can be eased aut with Russia's aid". The New York Times. Retrieved May 27, 2012. ^ "Statement by the Press Secretary on the United States-GCC Summit". April 17, 2015. ^ Manchester, Julia (December 28, 2017). "Trump to host congressional leaders at Camp David". TheHill. Retrieved January 8, 2019. ^ "NORAD intercepts aircraft near Camp David, where President Obama staying with family". The Washington Post. July 2, 2011. Retrieved July 2, 2012. ^ Weil, Martin (July 10, 2011). "Jet fighters intercept planes 3 times over weekend near Camp David". The Washington Post. Retrieved January 26, 2015. 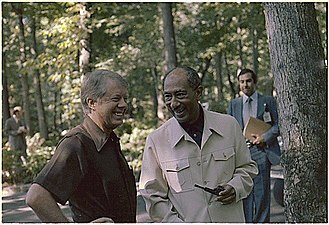 Wikimedia Commons has media related to Camp David.